Labour today returns the NHS to the centre of its pitch to voters with a pledge to spend an extra £37bn on the service in England as part of a “new deal” for patients. 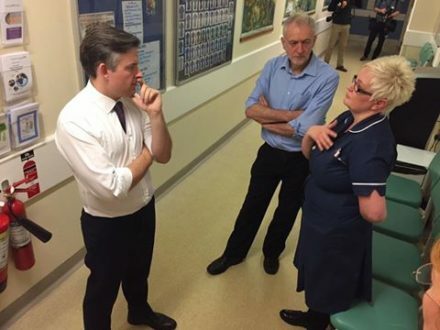 Jeremy Corbyn and Jon Ashworth warned said the NHS would become “unrecognisable” after five more years of Tory government and promised to spend heavily to take one million people off waiting lists, by restoring the 18 week target for patients, as well as investing in IT in an attempt to prevent another crippling computer hack. Corbyn laid the blame for last week’s cyber attack at the door of “Tory cuts” and painted a picture of A&E departments which are “struggling to cope”. “This is about having a health service for the many. In the past seven years the Tories have driven our national health service into crisis,” he said. Spend an extra £37bn on the NHS by 2022, including £10bn of capital funding to make sure that NHS buildings and IT systems are “fit for the modern day”. Take one million people off NHS waiting lists by the end of the parliament by reinstating the 18 week treatment guarantee. Ensure patients can be seen within four hours of arriving in A&E. Create a new £500m fund to handle winter pressures. Deliver the Cancer Strategy for England in full by 2020 to help 2.5 million people with the disease. “Labour is promising to give the NHS the resources it needs to deliver the best possible service for patients right across the country. NHS staff and patients have been let down by the Tories for too long,” Ashworth said. “Clinicians, experts and patients have all been calling for a significant cash boost to the NHS. We’ve listened to those calls and we agree. “In return for this investment, we’re demanding the NHS deliver a New Deal for Patients and ensure one million people come off the NHS waiting list, that a million more patients are seen within four hours in A&E each year, and that the NHS and community services work hard to tackled delayed discharge. “We will also bring forward £10 billion of capital investment to upgrade IT systems, prioritise the cyber security of the networks and renew crumbling hospitals.